When you are ready to order your supplies, have a think about grout colour. Mosaic shops can advise. You need to choose a colour which will unify the coloured tiles; or fracture them according to your design. When ordering your tiles, make sure you have enough tiles for larger areas. You can always improvise for small sections but running out is a disaster where a background colour needs to be consistent. You can never guarantee a re-order will be quite the same. Trace your design directly onto the base. If faint you may wish to go over it in a fine felt pen. When you have stuck your tiles directly onto the base the work can be grouted directly. 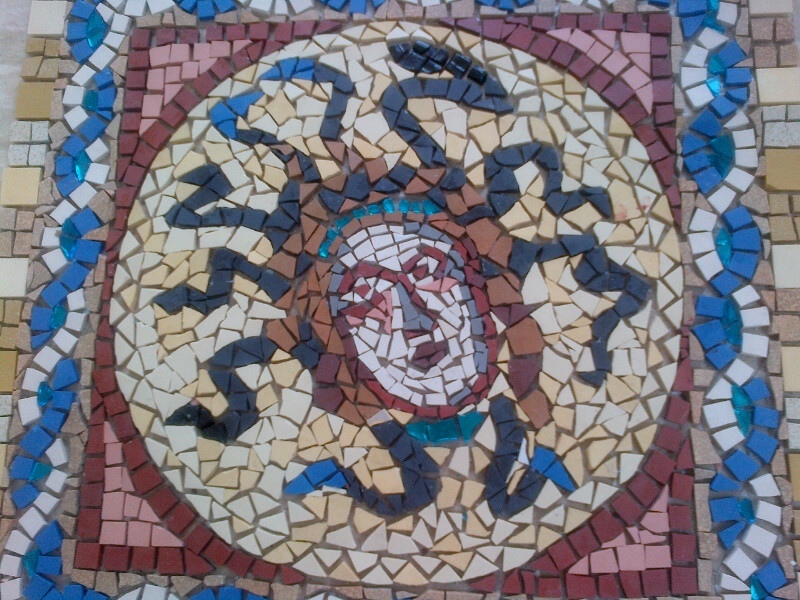 Here is in interesting video about the Roman original which inspired my Medusa piece which is to be found at Brading Roman Villa Isle of Wight. The ‘indirect method described in the video is the method I am also using for my Medusa. 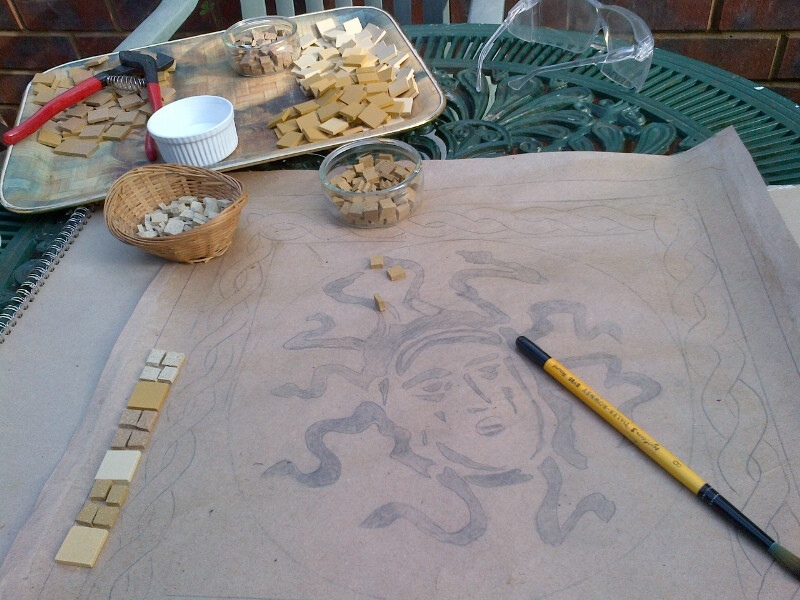 The tiles are fixed on paper so the piece can be made away from its final setting. When I come to grout the work I am going to ‘flip it’ and attempt to fix it to a concrete slab. First I will need to pre-grout it to fix the tiles. Because of this the design needs to be drawn on paper in reverse image. You will stick your tiles to the paper wrong side up. 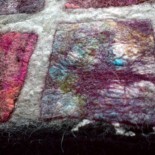 Then cover the full sheet with a thin coat of PVA and restretch to remove wrinkles. This is to prevent the brown paper wrinkling too much as you work. To cut tesserae without two much mess, tape a carrier bag to your working table edge, put on safety goggles and hold both tile and nippers in the bag while you cut with a firm hand squeeze. If you nip into the tile by 2 to 3 mm the tile should fracture in a straight line across from the angle of the pincers. To cut triangles position the nippers just off the corner point or the tile may splinter and cause waste. Cut a quantity of tiles for a particular area of your work so you can look for the best-fit pieces. This is like doing a jigsaw with freely chosen pieces. Stick the cut tiles with PVA to your board or paper. If you are working with glass tesserae they have a wrong side and a right side. Make sure you have the bumpy or wrong side up if you are working indirectly. Normally, you should work your boarder design first, then your central design and fill in background areas last. However strong enclosing shapes which are important to create a frame also need to be established before you get too far, as with this piece. Make sure you work your boarder edges at least 1 mm inside the base outline. Roman mosaic is distinguishable by the formal, not random, patterning of the mosaic tiles. These patterns have special names and give Roman mosaics their classical appearance.they are used by the artist differently for outlining shapes, creating flowing patterning or for infill. This is when tiles are laid in a regular grid pattern. 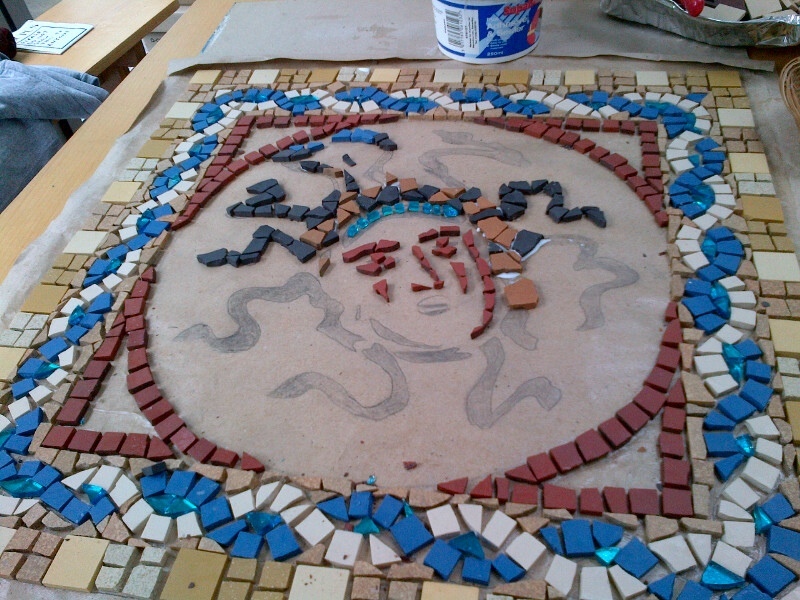 This is when tiles are laid in horizontal lines as in the background of the piece below. The tiles are just slightly offset from one horizontal line to the next to prevent crack lines. This is when tiles are laid so they flow round the central shape of the work. This enhancement is then contrasted by a background technique, usually opus tessallatum. The grout lines are as much part of your work as the tile patterns. You need to watch for grout lines which fracture right across, or down your work and create a crack line. 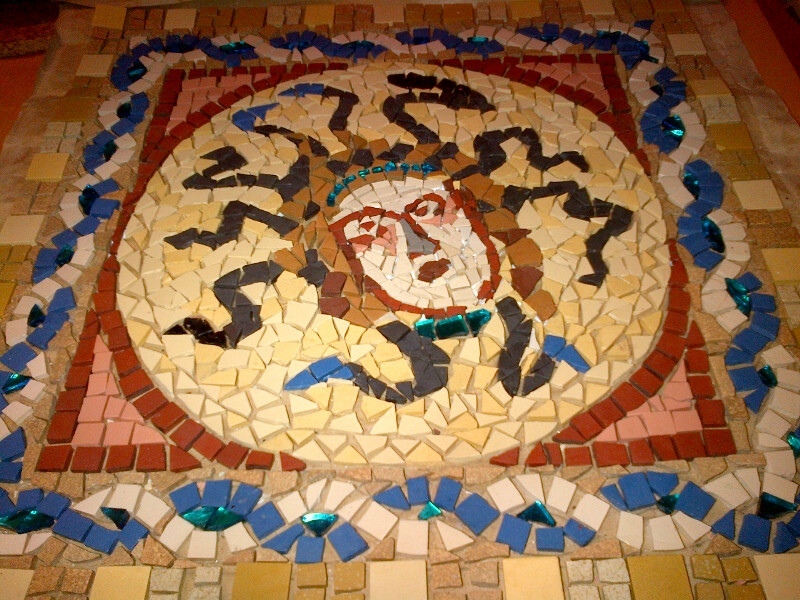 I finally completed Medusa after a long summer of trying to get out onto the patio to cut mosaic tesserae despite the rain. More and more rain. Towards the end I struggled a little with the face. I was just thinking hey I have finished at last and then I took a photo and realised she looked a bit like a too pale-faced squaw in glasses. The face was too square and too predominantly white. But the good thing about using the indirect method in mosaic is that it allows for some corrections. So back I went to the original ( I had a postcard) for ideas about what I could do without removing too many tiles. 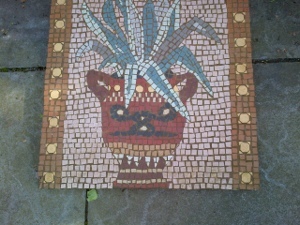 My mosaic was only one metre square and without using minuscule tiles I had less room than the Romans for creating depth. Nevertheless, I managed to prise off a few tiles without destroying the backing. A bit more grey shadow and some rounding of the face and I was much happier. Faces in mosaic need shadows and texture.